"A Shredder or a Boomer is a powerful weapon, but it kills acyclically. You see? It sends out harm and it takes nothing back. The bolt passes away into nothing. A sword, though, a sword is like a bridge, a crossing-point. The sword binds wielder to victim. It binds life to death. And when the binding is done—the sword remembers. When the Boomer's fire has burnt away into axion and neutrino scatter, the sword goes on, hungrier and sharper." The Cleaver is a Hive melee weapon that is normally carried by Knights. Ordinary cleavers are made of bone and metal and are of little value, but special swords exist that can be wielded by Guardians under specific circumstances. "Carved of fossilized bone and hell-forged metal, dulled by centuries of slaughter and execution, the Cleaver is the terrible weapon of a Hive Knight. Despite their mass, they swing easily, as if the sword were aware of its action and eager to tear into the Light." Picking up the Cleaver will change the camera perspective to third-person. Pressing the melee button will do a quick swing, which can be tapped rapidly to do a combo. Pressing the fire button will do a more powerful swing. It's possible to string together two quick swings followed by one powerful swing to get a very fast yet powerful combo. Finally, if a player's Supercharge meter is full, activating one's super will make the blade release a shockwave. Switching weapons will drop the sword, though grenades can still be used with the sword. "Long ago, the Moon fell to Crota. He wielded a sword so dark, it drained whatever Light it touched." During the story mission The Sword of Crota, the player picks up a Cleaver that belonged to Crota. This weapon is said to consume the Light of Guardians, but does not adversely affect the player during the mission. The player then has to use it to defeat the three Swarm Princes, after which the sword disintegrates and the mission ends. "This is the world the Hive craves: a universe creased by the edge of the sharpest sword." As part of the Dark Below, a special Knight called the Blade of Crota will sometimes appear on Earth or on the Moon. Killing this knight will drop an Ascendant sword, which functions very much like the Sword of Crota, except that it will break after about 30 seconds. Four swords also appear in the Quest Ritual of Sacrifice. 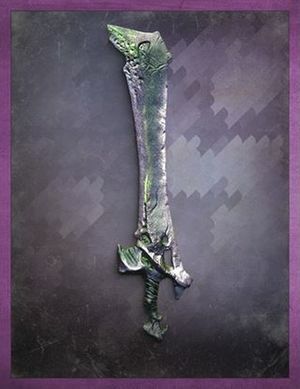 In Crota's End, the Ascendant sword is dropped by Swordbearers, and is the only way to kill Gatekeepers and Crota. "Let me tell you why you should not fear Willbreaker, the sword of Oryx. Firstly: Its blade is not dulled by age. Each death it trades for life hones its edge, gives it weight and gravitas and insistence within the vortex of its own totality. Nextly: Willbreaker transcends liminality. Willbreaker demands a subjugation more diffuse than the simple snick and smash of a physical brink. It does not have to touch you to wound you. And lastly—and this is critical: To be taken in Willbreaker's grasp is to know true bliss; that is, to be simplified; that is, to be reduced to one's most basic level, shedding all higher-order thoughts of fear or duty or selfishness; that is, to feel only pain. Now do you see? Now do you understand what you've done?" The sword of Oryx, the Taken King, used exclusively by him in battle until his defeat in Regicide. Eris Morn retrieved its core to help the Guardian create Bolt-Caster, Dark-Drinker, and Raze-Lighter.